Local band Spunjwurthi will provide the entertainment. CHARLESTON, SC - Baseball and beer are a natural combination, and throw in some terrific Lowcountry eats from Fiery Ron's Home Team BBQ and live Lowcountry music, and that winning formula just got even better. 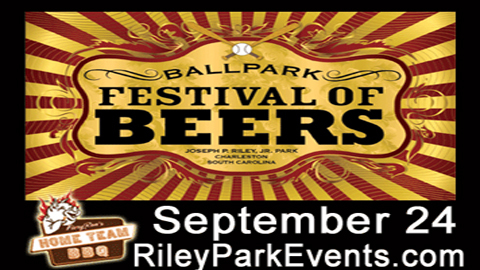 Home Team BBQ presents the 9th Annual Ballpark Festival of Beers this Saturday, September 24 at Joseph P. Riley, Jr. Park from 7-10pm. The first 2,500 fans through the Riley Park gate will receive a commemorative sampling glass. Nearly 100 different varieties of brew will be available to enlighten and quench the taste buds of every die-hard beer enthusiast. Patrons will receive sampling tickets, each good for a 5-ounce taste of their favorite beer. Home Team BBQ will have an array of delicious food available to complement the many suds, which are sure to satisfy the palates of each and every fan. Entertainment will be provided by Spunjwurthi, who describes their music as "Tom Petty's Heartbreakers circa 1981 jamming with The Robinson Brothers, Frank Beard, Bill Withers and the castaways from Bad Company." Many of your favorite classic rock albums will seem to come to life as those attending will hear the hottest tunes from yesterday and today. After the event, Home Team BBQ and The Brick will both host a post-BeerFest Party, with food and drink specials. The Ballpark Festival of Beers is a 21-and-over event. Those under 21 will not be allowed into the park. Advanced tickets are $25 - on sale now - and can be purchased at both Home Team BBQ locations (West Ashley and Sullivan's Island), The Brick (downtown), the RiverDogs Box Office or on-line at www.riverdogs.com and RileyParkEvents.com. Day-of-event tickets will cost $30. For more information please call the RiverDogs at 843-723-7241.